The West Virginia Genealogy site has several interviews with miners that fought in the Siege of Crooked Creek Gap, which was one of the areas nearest to Logan. It is considered the “hide tide” of the miner’s army advance. On April 20, 1914, in Ludlow Colorado, state National Guard troops fired upon striking immigrants that worked in the coal mines. The massacre resulted in the violent deaths of between 19 and 25 people; sources vary but all sources include two women and eleven children, asphyxiated and burned to death under a single tent. 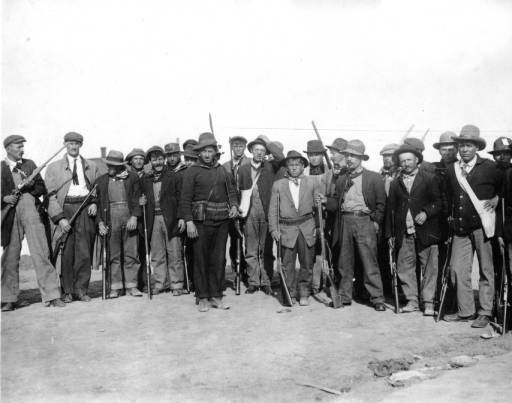 In retaliation, miners armed themselves and attacked dozens of mines over the next ten days, destroying property and engaging in several skirmishes with the Colorado National Guard along a 40-mile front from Trinidad to Walsenburg. It only ended when US regulars were sent in to disarm both the National Guard and miners. The entire war would cost between 69 and 199 lives, described as the “deadliest strike in the history of the United States”. Today in Labor History, April 18, 1912: What would become known as the West Virginia Mine War of 1912-1913 begins when coal operators refuse to agree to the union’s demand of wages on par with other union mines in the area. The strike quickly spread as it became clear that the goal of the coal operators was to bust the union and drive the United Mine Workers of America out.